While Bartlet gets ready for a town-hall meeting with college students, several staff members are concerned about a downed U.S. plane in the Iraqi desert. President Bartlet prepares for a town hall meeting with college students while the U.S. military races to find a downed American pilot in the Iraqi desert before the Iraqi military captures him. C.J. doesn't relish the notion of misleading the press over rescue preparations. Likewise, Toby tries to ignore updates from the distressed orbiting space shuttle which includes his brother, a payload specialist aboard the craft which cannot close its cargo doors. Meanwhile, a huffing Josh is dispatched to run down and convince the wayward Vice President to re-think his position on campaign finance reform. Everyone wave goodbye to Mandy, who despite being part of the campaign and now first term, will never be heard from again or subpoena'd or called to testify or appear in flashbacks. Small programming note: Going into season two, which is without a doubt my favorite series of tv of all time, I'm going to try writing my own recaps and will be posting once a week, on Fridays. Thanks everyone who's reading! Also, those watch online links look good for season 2! "We accidentally ran over her [Jorja Fox] leg with a limousine -- and she was great about it," said "West Wing" writer/creator Aaron Sorkin. Fox was filming on location in front of the Newseum in Arlington, Va. After the shooting, Fox fell to the asphalt alongside Dulé Hill, who plays Charlie, the president's aide. "We were waiting for them to yell cut and all of a sudden I feel something heavy on my leg," Fox said. "And there's this limousine coming off my right leg. I was like, OK, it's a new life experience. I've been run over by a presidential limousine, which is kind of hilarious." Fox jumped up immediately and she thought she was fine, but producers insisted she get checked out at a hospital, where all the nurses recognized her from her role on "ER." "I felt like a walking miracle because I didn't break anything," Fox said. "It was kind of like a big bruise, a big contusion." "I have heard a lot of people say that it's the worst cliffhanger of the year," says [Aaron] Sorkin, who concedes there may be some truth there. "In everything I have written I tend to get into a little bit of trouble with action." 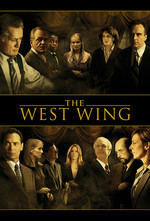 "The last two minutes of the show in May are really the first two minutes of the season opener," Sorkin says. "It really wasn't done to be shocking or to shake up the show." "The first time I saw the [final scene] I said, 'Holy cow, it doesn't really look like our show,' "
"'West Wing' cliffhanger dogs creator"
I had never heard that he was criticized for the cliffhanger. And I had probably never approached this episode all that critically, I suppose. I can't watch it at the moment, but isn't there someone yelling over the radio "Who's been hit? Who's been hit?" or something similar? That seems a bit television-y. And I think there was a bit of daring there in doing this thing early in the series, rather than late, where it would have been a clearer dying gasp for ratings. Anyway, my friend and I occasionally make the space shuttle landing gesture at each other to indicate that things are going ok right before the deluge hits. It's a thing. Hey, maybe Mandy was hit by a disintegration beam? Oh, god, we've got people down. People down, people down! Who's been hit? Who's been hit? I realize that throughout the entire series, Sorkin recycles material from the (criminally underrated) SportsNight, but seriously, giving the last episode of the first season of both shows the same name? That's just lazy. It's a thing with him. The last episode of the first (and only) season of Studio 60 on the Sunset Strip is also named this. He did break the trend with Newsroom. Nope. Just moved it to the end of the series. Nothing wrapping up a shooting attempt on the president, his daughter and key members of his team with sprightly end credit music. Whoever selected that music should be shot.